Left to Right: Finalflame, Sporebat (cuz they are the best Hunter pet! ), Effy, Ranico, Ariano, Gv, and some demon minion guy. Last night, when Ranico whispered me and asked if I would like to do a Challenge Mode, I figured no big deal. I had done a whole ONE other Challenge Mode, but we had completed it, getting out with some VP and a Bronze medal. They are tough. They are a lot of healing. They are a lot of cooldowns. They are about organization and teamwork. They are very much about knowing your class and eking out every drop of potential possible – both the potential of your class/spec and the potential of yourself. But a run in 45 minutes or less – I told myself, that is no biggie. They were going for the Gold. They wanted a completion in 15 minutes or less – not 45. I admit, I got a little panicky. My last Bronze had included a wipe or two, and a few restarts before that. It had included me bottoming out my mana nearly every pull, abusing my healing cooldowns and Mana Tide Totem, and stealing drinks for regen whenever I could. The damage in Challenge Mode is way more heavy and spikey than in regular Heroics – little, efficient heals do not cut it. What was I doing here?? Okie, Effy, just keep telling yourself you are a good healer. You know your Shaman. You can do this. A few wipes on trash and I was really anxious. We practiced on the trash up to both Wise Mari and the Lorewalker encounter. 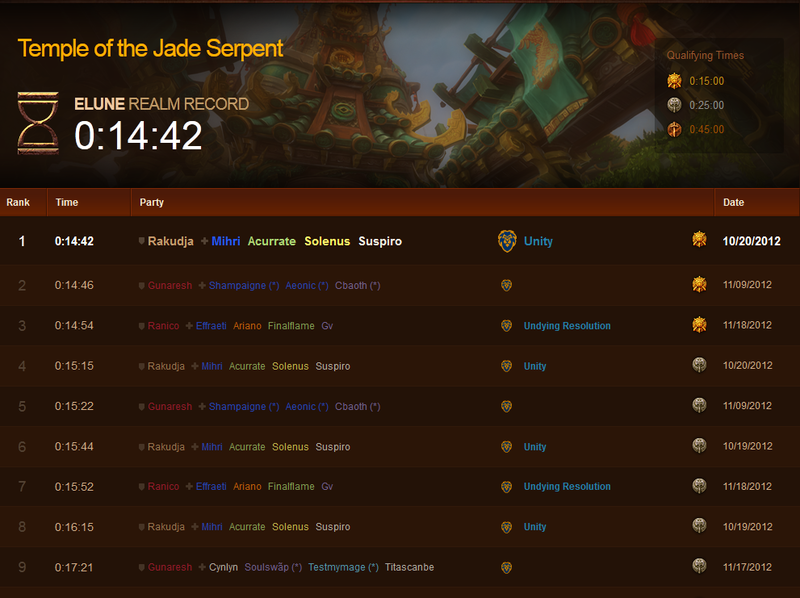 At one point, we did the dungeon all the way through, and ended with a decent time on a Bronze. 32:59, plenty of time to spare, and that was after wipes and doing trash on both sides before killing Wise Mari. Just practice, but a full run of it. Breathe. You got this. Mana is in short supply, as are cooldowns, but you got this. The next time around, I was starting to feel fairly competent, if not comfortable, with the flow of the fights and the rotation of my cooldowns. There seemed too few, as I would have gladly used several for every pull, but I know my Shaman and her specifics, and I even feel I know her Mists changes fairly well at this point. I will not go so far as to say I know her limits, because previous to last night, I would never have attempted such a harrowing run. By the time we completed our first Silver run, in 17:45, almost half the time of our previous run because we did it in order, I was nearly convinced my cooldowns were timed around the encounters… Managed properly, I felt I was able to space them just right. Sure, mana was a sorely abused commodity, but I was getting around running low by popping Ascendance and spamming Healing Wave at those times. I was also taking full advantage of drinking every chance I got, especially during RPs. We got ourselves down to 15:52 for our second Silver run. Almost a full minute shy of a Gold. Could we cut a whole minute off our time? It was a hefty sounding task, considering the fumes I was getting by on for most of the run already, and I knew everyone was pushing themselves. But we were feeling confident at that point, our adrenaline was getting up, and we really wanted the big ol’ Gold. 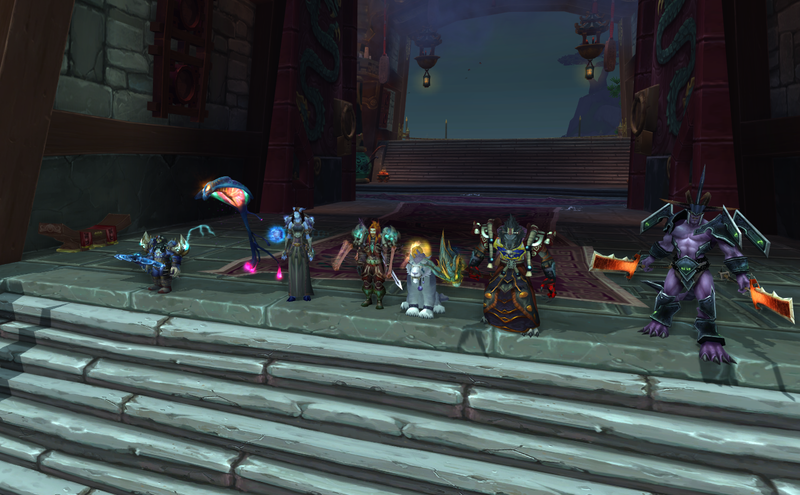 Our next run went really well until Liu Flameheart. One death seemed to snowball into several wipes. Probably because we were rushing to finish at that point. Somehow, we still managed a Silver, though. 23:01 was still pretty good. Conversation turned to whether that run had had the chance of being a Gold run. Ranico asked if we were getting tired. It was about 10:30pm or so at that point. I was not tired – I was energized. Every part of me was wound, and I knew I was pushing myself and Effy, but I also knew I could do better. We all agreed that we would make one more solid effort – Gold, Silver, Bronze, whatever we placed, that would be our last run. It was time to pull out all the stops. More stuns. More DPS cooldowns. Better timing on my Fire Elemental. Heck, maybe even my Earth Elemental if it would help our DPS. It turned out to be a near perfect run. Everything fell together just as we planned. Other than my near panic at the beginning of the Wise Mari fight, where it seemed like the entire dungeon was smacking on Ranico and a few seconds of “ugh!” when the bird in the library silenced me, I felt my little healer zen take over. And we got our Gold, with 6 seconds to spare. Woot! Number 3 on Elune! GJ, guys! Gv offered to record our last attempt, and boy I am glad he did! He posted it on the guild forums, and I thought I would link it here as well. It is pretty exciting, really. Challenge Modes seem the ultimate culmination of raid awareness, toon awareness, player skill, planning, and team work. The most awesome part is knowing it was a display of utmost effort from all of us to not only accomplish the dungeon at all, but to keep trying and tweaking and to earn that Gold. This entry was posted in Challenge Mode, Healing, World of Warcraft and tagged Challenge Modes, Restoration Shaman, Shaman Healing, World of Warcraft. Bookmark the permalink. I’ve been trying to put a group together for Challenge Modes but have had trouble finding a good tank that’s interested. Our guild tanks seem rather “meh” about the whole thing, I’m not sure why. This video will be useful if I finally manage to pull a team together. How did you skip the trash before the last boss? I hear someone say, “Dismissing pet” and then you count down to go, but I’m not sure how you actually skip them. For skipping trash, we used two methods. In the library, we each used an invisibility potion. Had we a Rogue, the Shroud might have worked as well, but I am not sure, because if Shroud functions like Stealth then the mobs would have seen us. We walked right through them. The second method was on the final three sha mobs before the last boss. Our Hunter dismissed his pet, because he pulled the three, dragged them away so the rest of us could run in, and Feigned Death to reset them. These two methods worked well for our purposes, but might not in all situations. It only worked because we did not have to walk back through either time. I think there were a number of combinations we could have made work. It is a matter of utilizing all of the available classes’ strengths. If not a Hunter, I am sure we would have figured out another way. The real trick was figuring out just the right number of mobs to skip. One run we skipped too many and actually had to go back and kill some. Very impressive! I’m so happy for you!